Much of what happened in Rennes, France, is happening in Canada today. The response to the Public Square Rosary Rally has been excellent. For the next one, on October 14, 2017, our goal is to have 500 Rallies praying the Rosary in public, because every city in Canada and the world is in need of conversion. This story of the D’Orvilles family is one of many examples where the power of the Rosary helped to transform society. You can do the same, and it’s easy. Just take your Rosary, the banner we will send you, and then stand in a public spot on October 14, 2017 with family and friends and pray. It’s that easy! When you decide to become a Rally Captain, and I pray you do, simply go to https://www.canadaneedsourlady.org/public-square-rosary-rally/ and sign up on our Rosary Rally page devoted solely to receiving your pledge to Our Lady. On the Web site, you’ll find more details and how we’ll help you have a successful, easy and fulfilling Public Square Rosary Rally on October 14, 2017. As a Rally Captain we will take a red rose to Fatima on your behalf in October. 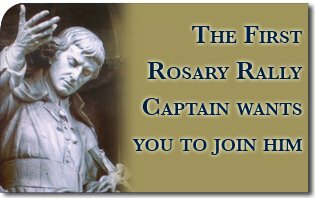 This is a small way to show our appreciation to you for becoming a Rosary Rally Captain by helping spread devotion to Our Lady each year. Together we can repeat history for the sake of Canada and help bring on the Triumph of Mary’s Immaculate Heart! * Adapted from Eddie Doherty, Wisdom’s Fool (Bay Shore, N.Y., Montfort Publications, 1993), 214.